Even if seniors still have generally good health, it may be difficult for them to properly manage and maintain their finger and toenails alone. Limited vision, an inability to bend over and touch the feet, and the health problems that come with old age can result in poor nail hygiene which may have serious consequences. Here’s what Oshkosh, WI in-home care providers can do to help their loved ones. Ingrown nails, nail fungus, corns, calluses, and ulcers are all common nail issues that affect the elderly. Since the aging immune system is so weak, these nail issues can lead to infections that may travel through the bloodstream and cause severe problems if left untreated. Many seniors also live with poor blood circulation due to diabetes or other health conditions, so they may not feel or notice issues with their feet and hands right away. 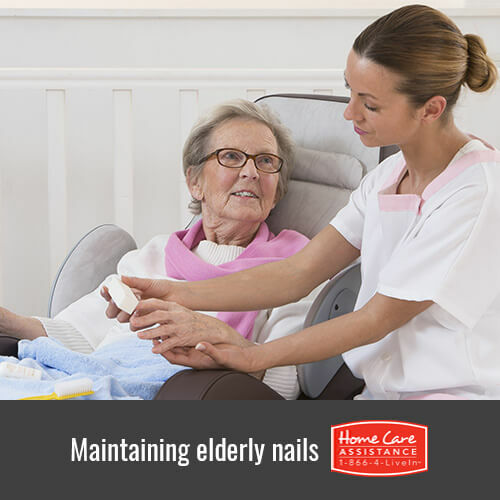 To prevent infections that could lead to amputation or even death, it is important to always keep the nails of your elderly loved one trimmed, clean, and healthy. Many seniors need assistance with nail hygiene because they cannot reach their feet themselves, or the joint immobility of arthritis may make it hard to use clippers. In general, feet should be kept clean, warm, and dried, and any shoes should fit properly without putting pressure on the nails. Keeping your loved one’s feet warm and dry will prevent fungus that could grow under the nails or along the feet. Fingernails should also be warm and dry as much as possible, and any hangnails should be clipped neatly instead of being torn off. Toenails should be cut in a straight even line in order to prevent ingrown toenails from developing. It is important to regularly examine the nails of your elderly loved one so that you can take them to the doctor as soon as any fungal infection or ingrown nails develop. If you have trouble maintaining your loved one’s nails or need help tending to his or her personal care needs, turn to Home Care Assistance. In addition to helping seniors with everyday tasks such as bathing, dressing, and grooming, we also provide specialized stroke, dementia, and Alzheimer’s care Oshkosh seniors need to age in place with confidence. Contact us at (920) 710-2273 today to speak to a dedicated Care Manager about our services. Don’t forget to schedule a free in-home consultation when you call.